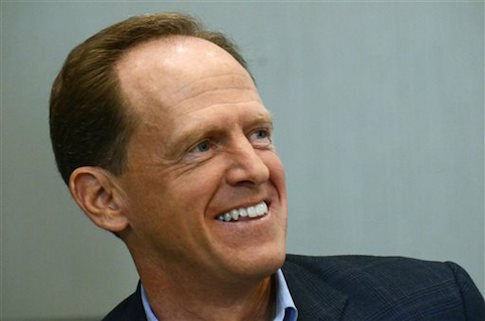 The Pennsylvania Fraternal Order of Police announced on Tuesday its decision to endorse Republican Sen. Pat Toomey (Pa.) in his reelection fight against Democrat Katie McGinty. The law enforcement group, which has a membership of more than 40,000 officers across the state, wrote in a letter to Toomey that he has "shown a strong allegiance to the law enforcement community." "As a current member of the U.S. Senate and a former U.S. Congressman, you have proven your commitment to the citizens of our State," wrote Les Neri, president of the Pennsylvania State Lodge FOP. "You have also shown a strong allegiance to the law enforcement community by fighting for legislation that helps protect law enforcement officers while on and off duty." "It has been my honor to stand with the brave men and women in law enforcement who put on the uniform everyday and head into harm’s way to keep us safe," Toomey said in a statement released by his campaign. "Whether it’s ensuring they have the defensive gear they need to protect themselves and the public, aiding the families of fallen officers, or even simply speaking out against those who scapegoat the community, I will remain dedicated to helping the law enforcement community." The endorsement comes as Toomey is on a week-long "Keeping PA Safe" bus tour across the state that is focusing on his support for police. The campaign has attempted to make security a central pillar of its attacks on McGinty by focusing on her reluctance to speak out against Philadelphia’s sanctuary city policy, which is opposed by both Toomey and the Obama administration. The attacks became even more pointed last week with the news that an illegal immigrant from Honduras, who was on the street thanks to Philadelphia’s sanctuary city policy, raped a child under the age of 13. Ramon Aguirre-Ochoa had already been deported once in 2009 but returned to the country. He was arrested again in 2014 but was set free by Philadelphia authorities despite a request from U.S. Immigration and customs Enforcement (ICE) that he be turned over to the agency. Toomey, who has been a leading voice in the Senate against sanctuary cities, says that Philadelphia’s sanctuary city policy will remain if McGinty beats him in November. "The debate over dangerous sanctuary cities has now tragically moved to Philadelphia, a distinction no community would ever want," Toomey said. "While I will continue to lead the fight against these extreme policies, Katie McGinty has made it clear they would continue unabated under her watch." "Pennsylvania cannot trust Katie McGinty with our public safety," Toomey said. This entry was posted in Politics and tagged 2016 Election, Katie McGinty, Pat Toomey, Pennsylvania, Police. Bookmark the permalink.